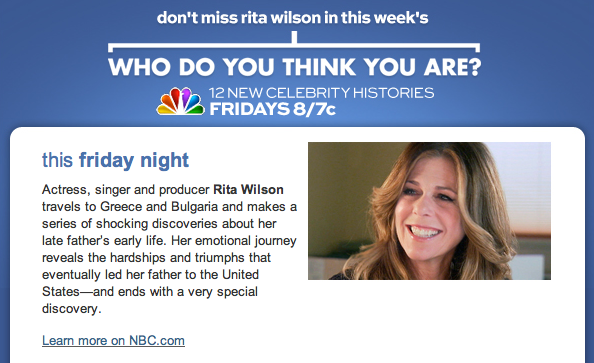 TOMORROW Rita Wilson goes to GREECE on "Who Do You Think You Are?" genealogy TV program. "Actress, singer and producer Rita Wilson travels to Greece and Bulgaria and makes a series of shocking discoveries about her late father’s early life. Her emotional journey reveals the hardships and triumphs that eventually led her father to the United States—and ends with a very special discovery."